The “Lonesome Dove” author on closeted cowboys, pointless Pulitzers, and his latest Old West novel. 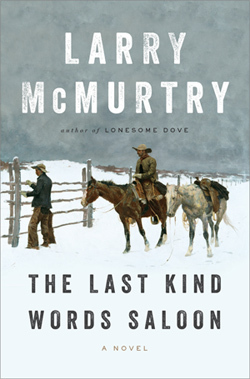 AFTER MORE THAN five decades trying, Larry McMurtry—the Pulitzer Prize-winning author of Lonesome Dove, Oscar-winning screenwriter of Brokeback Mountain, and creator of Booked Up, one of the planet’s largest used bookstores—still can’t escape the enduring mythologies of the Old West, which he set out to debunk with the publication of his first novel, Horseman, Pass By, back in 1961. The son and grandson of cattlemen, McMurtry, 77, was raised on the plains near Archer City, Texas, whose landscape and small-town mentality inform so much of his work—he left at 18 for college, returning decades later with the unlikely dream of transforming his hometown into a book lovers’ mecca. Among his 32 novels and 14 nonfiction works, you’ll find fictional accounts of Calamity Jane, Billy the Kid, and other legends brought back to earth. In 1997, he told the New York Times Magazine he was “bored to death with the 19th-century West,” and figured Comanche Moon, the last installment of the Lonesome Dove series, would be his final say on it. But in his new novel, The Last Kind Words Saloon, fans will recognize that familiar pace, that spare diction, those somnolent settings—fading frontier towns with their ignorant, stoic cowboys and ranchers, beat-down Indians, whores, rustlers, drunks, schemers, and desperately lonely wives. Mother Jones: I thought you were done with the Old West. What happened? Larry McMurtry: I changed my mind. I got an idea and I followed it. MJ: The Last Kind Words Saloon follows Wyatt Earp and Doc Holliday, among others. Yet their famous gunfight at the OK Corral seemed almost incidental. Was your aim to expose the mundane nature of this legendary event and its household-name characters? LM: I don’t think I was that ambitious. It seems like the OK Corral is a good place to stop. I paid it much less attention because it was kind of a throwaway, an event that wasn’t supposed to happen. Neither side wanted to fight, and yet guns started going off and a fight ensued. MJ: You’ve described Old West mythologies as destructive. Which ones particularly grate? LM: The Western notion of masculinity goes back a long way. It doesn’t allow for women, and it’s also racist—it doesn’t allow for other cultures. MJ: Is your antipathy partly rooted in your own childhood run-ins in small-town Texas? LM: It was more like the culture that I lived in and absorbed by osmosis: It was a racist, anti-feminist culture, and it had been throughout the whole period of settlement. It was still all that when I was a little boy. MJ: To what degree have you succeeded in your demythologizing mission? LM: I haven’t succeeded at all. It’s just as racist and misogynistic as it ever was. The image of the cowboy is one of the dominant images in American culture. MJ: In the book, a brief sub-plot involves a group of ruthless Indians who do horrible things to a group of white travellers, and are in turn dispatched by the white authorities. What were your intentions with that episode? LM: It was timely. For one thing, it actually happened during the period and in the places I was writing about. It was the last massacre on the southern plains. It was the final breakaway band of Kiowa who did it. It took place about 20 miles from my family home in Texas. General Sherman was on a tour of the western forts. He was there early in the morning and didn’t see the Indians. But they saw him, and waited until he left for Jacksboro. In the afternoon, seven teamsters came along that route and were massacred. MJ: Much like Woodrow Call from Lonesome Dove, the men in this book lack introspection; certainly they are reserved in their self-expression. The women are lonely and miserable and hungry for attention. What kind of men were your rancher father and grandfather, and how did they relate to their own wives? LM: One of the reasons I wrote Lonesome Dove was to try to understand my father. My father’s reaction to the hardships his mother endured marked him for life. They left Missouri and came to our family home. There was nothing there when they arrived, but there was a stream. My father saw his mother carry bucket after bucket after bucket of water up from that stream to the house. She had 12 children. It made him intolerant of my mother, because she was not as competent as his mother. MJ: What was it like for a studious kid like you growing up in small-town Texas? LM: I didn’t realize that it was as limited as it was until I got to places that weren’t limited, like Houston. The only bookstore I had was the paperback rack at the drugstore. MJ: How did your father feel about you going off to college and becoming a writer? LM: He didn’t oppose it. We visited Rice and he saw what a wonderful school it was. He had some vain hope that I would change my mind and become a veterinarian. MJ: Is your family still in the cattle business? LM: Unfortunately, they are, and for nostalgic reasons. My two younger sisters both worshipped my father. MJ: You studied under Wallace Stegner at Stanford, right? LM: Actually, I didn’t. He was in India the year of my scholarship. I studied under Malcolm Cowley and Frank O’Connor. Mr. Cowley came in and turned off his hearing aid and let us all squabble among ourselves. But we knew he had value, because he came from the world of Hemingway, Faulkner, Sherwood Anderson, Fitzgerald. He knew all of them. He wrote a wonderful book called Exile’s Return about that generation. In the end, Hemingway turned against him. Frank O’Connor was an Irish short story writer. He didn’t like teaching, and he was irascible. I mentioned once that I had read Smollett, and he exploded. But he was an exceptional writer, a beautiful short story writer. MJ: You felt that Lonesome Dove was misinterpreted, that you’d intended it as an anti-Western. In what sense? LM: Would you like your menfolk to be that way? The Western myth is a heroic myth, and yet settling the West was not heroic. It ended with Custer; it was the end of the settlement narrative, which had been going on since 1620. MJ: Were you surprised when you learned that it had won the Pulitzer? LM: I was teaching in Uvalde, Texas, the day I won. I gave six speeches that day. My friend Susan Freudenheim told me I had won the prize. I was too busy to have much of a reaction to it. I once owned a collection of 77 novels that won the Pulitzer. The only good novel of the bunch was The Grapes of Wrath. If I hadn’t won the Pulitzer, I doubt I would have been president of PEN. MJ: Do you find it strange being so closely identified with a book you wrote almost 30 years ago? LM: That’s just the way it was and the way it is. Many people are identified with one book. Philip Roth with Portnoy’s Complaint. Joseph Heller and Catch-22. Tennessee Williams and A Streetcar Named Desire. Strangely enough, Norman Mailer never wrote a novel that identified him. I think The Executioners Song is a great book. MJ: I was surprised to learn that you’d never watched the Lonesome Dove miniseries with Robert Duvall and Tommy Lee Jones. How could you not? LM: It was easy. Another myth I’m exploding is that writers are so entranced by their own work that they read it over and over, or watch it over and over as a film. I was tired of Lonesome Dove before it ever became a miniseries. Most writers don’t do that. It’s fine if other people enjoy it, but I’ve moved on. It was a long miniseries, and I was traveling when it came out. I simply didn’t have the time. I’ve seen snippets, and it seems pretty good. MJ: How has Hollywood treated your work as a whole? LM: The highlights would be The Last Picture Show, Lonesome Dove, and Terms of Endearment—Emma is one of my favorite female characters. The lowlights would be Lovin’ Molly, based on my second novel, Leaving Cheyenne. It was badly cast, badly costumed, badly located. My father was horrified because they dressed the cowboys in bib overalls. MJ: I hear you’re a fan of Downton Abbey. What about Deadwood? LM: Deadwood? I don’t think people in the West talked that way. There’s nothing wrong with expletives, but they’re overused in Deadwood. They lose their force. My writing partner, Diana, and I, along with my wife, Faye, have binge-watched The Sopranos, Six Feet Under, which resembles a long, lovely novel, and True Detective, which has brilliant dialogue. These are all top-notch shows. MJ: Brokeback Mountain, whose Oscar-winning screenplay you co-wrote with Diana Ossana, was a huge deal for many people. How did your longtime fans respond? LM: I don’t really know. I don’t even know if I have longtime fans. MJ: Gay characters are scant in Old West tales. The lone gay character in your new book is a rich Englishman who comes to ranch and build a castle on the plains. What do you suppose it might have been like being a gay ranch hand in those times? LM: I think it would have been rare that it was acknowledged. MJ: You returned to Archer City hoping to transform it into a literary destination. Did you really imagine your little hometown could support such a vision? LM: I thought the rest of the world could. MJ: I understand you auctioned off the majority of your inventory in 2012. LM: I auctioned off the minority. I still have over 200,000 books left. MJ: Have you ever read an e-book just to see what it was like? LM: No. Books have given me infinite pleasure, both reading books and collecting books. And there’s a 500-year-old tradition backing up my response. MJ: Prior to the book town project, you went through a period of debilitating depression, which you have described as essentially the death of your personality. How much success have you had reconnecting with the old Larry McMurtry? MJ: You’ve said you don’t read much fiction these days. What do you read, and what’s the latest book you’ve read that you’d recommend? LM: I haven’t read much fiction for 25 years, but I reviewed hundreds of novels in the ’70s and ’80s. There’s one book which I think is unusually beautiful, and that’s The Emigrants, by W. G. Sebald. It’s not exactly a novel, but it’s not exactly not. MJ: You still write books on a manual typewriter. What are some other habits from which you prefer not to deviate? LM: Everything. I don’t do well with changes in my routine. I read at least three newspapers a day, for example. I’m frustrated if for some reason I can’t get ahold of all three. MJ: You also write a specific number of pages each day, no more, no less. I get the “no less,” but why no more? LM: Because you can empty the well. Sure, you’ll have days you can write 15 pages, but then you might have days when you can’t write any pages. Most writers try to avoid that. MJ: You’ve said that you usually write the ending of a book first. How would you write the ending of this interview? LM: I have never written the end of any of my novels, but I do conceive of the ending before writing. I write to get to that ending. The ending of this interview? Thank you.